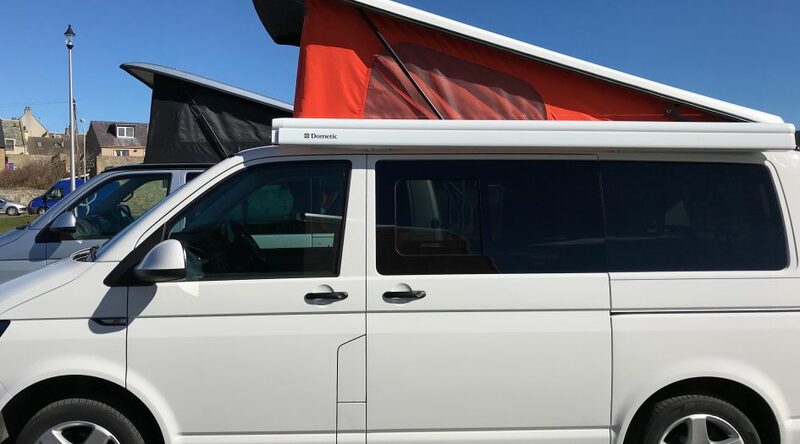 Sylvie, with her elevating roof, sleeps four – two in the rock and roll bed and two in the roof space. Spacious, comfortable and functional all rolled into one, and, it drives like a dream. It is kitted out with cooker/sink/fridge/cooking/eating equipment and even a campervan cookbook! From £80/day. 3 day minimum hire. With the elevating roof space available it lends more headroom for the 6 foot plusers! Fully equipped kitchen and cosy diesel heater. It has 4 seats so perfect for a family with 2 small children or hire an awning to sleep more adults. Had a fabulous week in Sylvie. Van is comfortable and well equipped. Surprisingly economical on fuel. Pick up and drop off was very convenient. Would highly recommend. We are based on the Moray Firth and hire camper vans and a motorhome for your holidays, locally or, for your tour around the beautiful Highlands of Scotland, the North Coast 500 or over to the West Coast. On the doorstep, the Moray Firth itself, offers a haven for wildlife lovers, water sport enthusiasts and includes miles of safe sandy beaches for family fun. Canoeists will enjoy the rivers Spey and Findhorn, while historians will be surrounded by castles, Pictish history and battlefields. Walkers can find the Coastal path on our doorstep and the Cairngorms just an hour away. Moray and the Highlands are a golfers’ paradise with many championship courses available throughout both regions. If it’s a ‘dram’ you’re after then the Speyside Malt Whisky Trail will surely appeal. Just along the road is the Spiritual Eco Community the Findhorn Foundation which attracts visitors from around the world throughout the year and is a cultural and spiritual delight not to be missed! 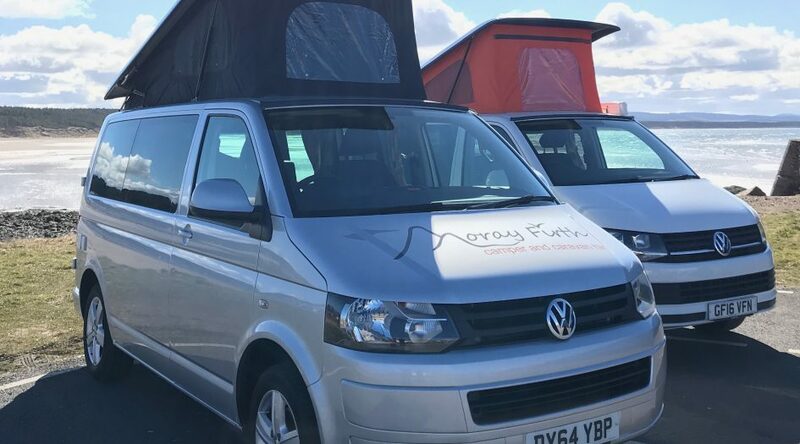 At Moray Firth Campervan & Caravan Hire we offer a 6 berth Motorhome, a Classic VW Campervan, a VW T4 (sleeps up to 4), VW T5 (sleeps up to 4) and a touring caravan available to hire when you are. Our one bedroom holiday flat for rent in the quaint and picturesque coastal village of Hopeman, is also ideal for a local stay. Please have a look below, scroll down and see what we have to offer. If you have any further questions, perhaps about the area or our airport pick up service please don’t hesitate to get in contact with us.